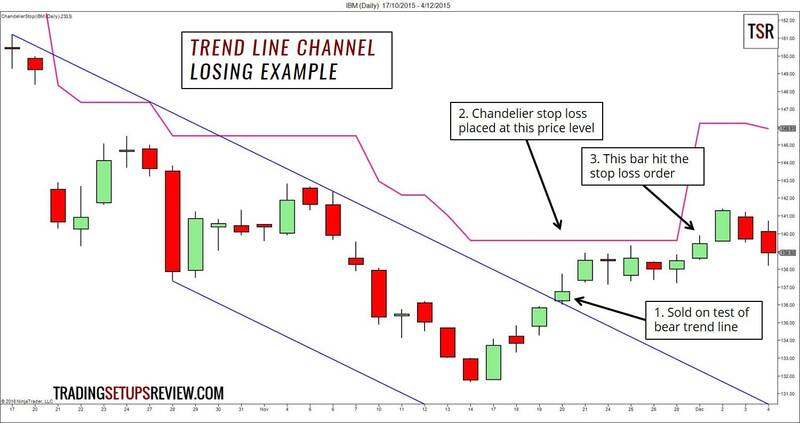 Trend line channel – a simple tool based on plain ol’ price action. Basically, it’s a pair of lines that highlights the market trend, trade entry, and exit. What more can a minimalist trader ask for? Or should I say what less can a minimalist trader seek? 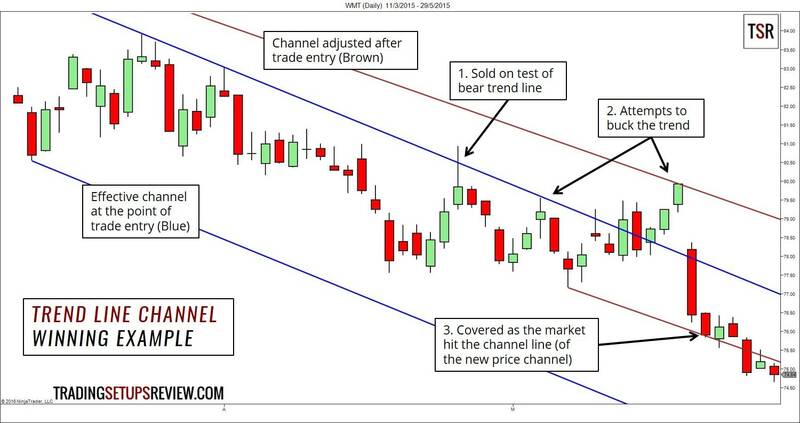 Before you can trade with a trend line channel, you need to know what it is and how to draw it from scratch. What’s a Trend Line Channel? As a price action trader, first, you learn to observe market swings. Price swings allow you to follow what is happening in the market right now. Then, you connect the swings to get a trend line. A trend line helps you to make sense of the past (trend). Finally, you project parallel lines to form a price channel. The channel line predicts the extent of future price action. Most charting platforms offer the ability to project parallel lines. If you are still looking for a charting software, you can check out NinjaTrader here. Or if you prefer an online charting platform, TradingView is one of the best I’ve seen. In a nutshell, trend line channel offers a rounded view of the market price action. Many traders do not trust trend lines and channels. This is because they see other traders posting trades with perfect trend line channels. The problem is that with hindsight, anyone can draw a trend line channel that always work. Perfect, every time. But in real trading, traders struggle to meet such perfection. Frustration ensues. There are many approaches to drawing price swings, trend lines, and channels. But the key is to stay consistent. 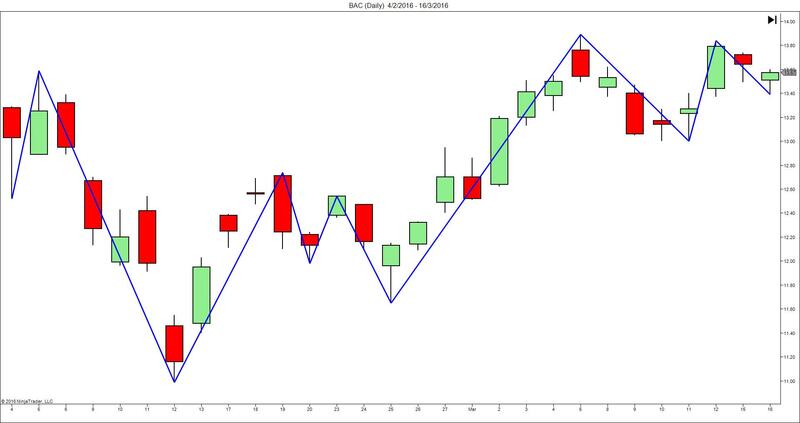 Here, I’m using the channel drawing/adjusting method described in my trading course. The course is aimed at day traders. 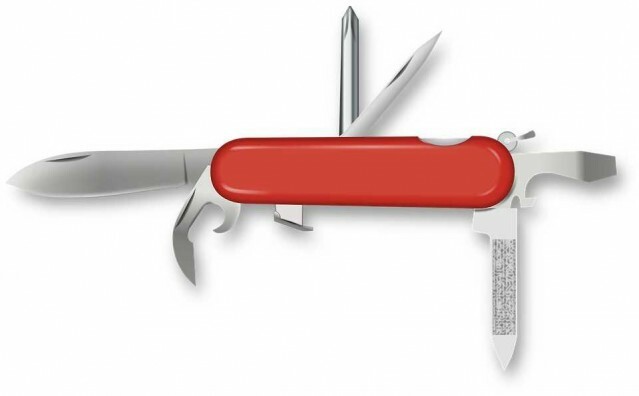 But basic price action tools like swings, trend lines, and channels are useful on all time frames. After mastering how to draw trend line channels, you can test-drive the trading rules below. Channel must be sloping upwards. Price pulls back down to test the bull trend line. Channel must be sloping downwards. Price pulls back up to test the bear trend line. This is a daily chart of WMT in a bear trend. We used the aggressive entry method here. A sell limit order brought us into a short position as the market tested the bear trend line. This is not a textbook trade with a smooth trip to our target. (I selected this example randomly.) You can see how the market struggled to push down and made several attempts to rise. As the market resumed its downwards drift, we adjusted the trend line channel. We took profits as the market hit the channel line of the new bearish channel. This is a daily chart of IBM, again in a bearish context. A Chandelier stop-loss was used as pointed out in the chart. The stop-loss was hit as the market surged up. This trade was a loss. Let’s accept it. But that’s something we can learn from the price action that followed. It highlights the utility of trend line channels for profit-taking. The chart below shows a bearish channel adjusted based on subsequent price action. Every price action trader has different methods for entering the market. It’s conceivable that some traders went short within this area. 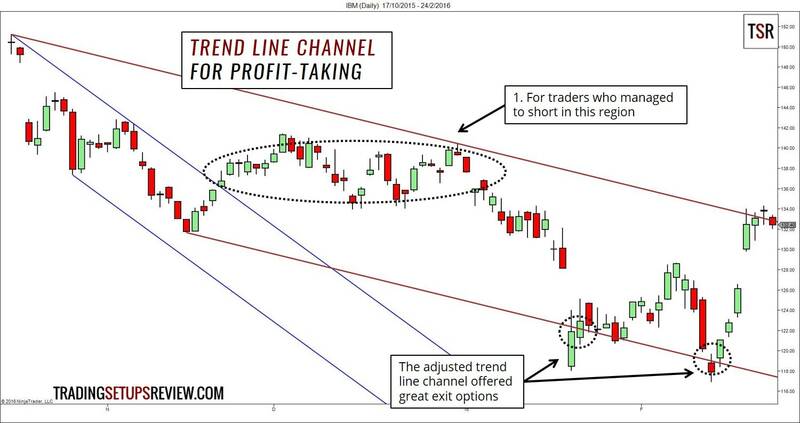 If you were in a short position, the adjusted trend line channel (brown) offered solid options for profit-taking. Look for channel trading setups that enjoy confluence from basic support and resistance levels. For a price action trader, this is a simple approach that works. Or, if you find value in the synergy between price action and indicators, use an oscillator (e.g. Stochastic, CCI) to confirm the channel setups. E.g. An oversold signal with a bullish price pattern on a positive trend line. For judging the steepness, you can use a 45 degree line as a benchmark. Markets with steep channels are more likely to experience a deep pullback before resuming. Shallow channels can be traded if you are looking for a trading range setup. As for evaluating the channel width, compare the channel width to the average price bar range. If the channel width is smaller than a couple of wide range bars, consider it narrow. It’s important to note the channel width as it indicates the potential reward of a channel trade. This channel strategy works on the premise that a trend line channel would contain the price action. Other variants try to capture the break-out from a channel. Can you please tell me among all of your trading setups, which ones do you consider to be superior? There’s no straightforward answer to this. First, identifying the general market bias is more important than the particular setup. Next, it depends on your personality. For instance, if you have the patience to let profits run, you might want to trade pullback type swing trades with setups like 9/30. If you like short trades in a sideways market, the Gimmee Bar is the good place start. Eventually, you will probably come up with your own trading setup. One that works for you and one that you understand best.